A team led by James Henderson, assistant professor of biomedical and chemical engineering in the L.C. Smith College of Engineering and Computer Science (LCS) and researcher in the Syracuse Biomaterials Institute, has used shape memory polymers to provide greater insight into how cells sense and respond to their physical environment. The goal of the present research was to develop a temperature-sensitive shape memory polymer substrate that could be programmed to change shape under cell-compatible conditions. Shape memory polymers (SMPs) are a class of “smart” materials that can switch between two shapes on command, from a fixed (temporary) shape to a pre-determined permanent shape, via a trigger such as a temperature change. The breakthrough needed to achieve the research goal was made by Kevin Davis, a third-year Ph.D. student in the Henderson Lab. Davis was able to develop a SMP with a transition temperature that worked within the limited range required for cells to live. He observed greater than 95 percent cell viability before and after topography and temperature change. This is the first demonstration of this type of cell-compatible, programmable topography change. 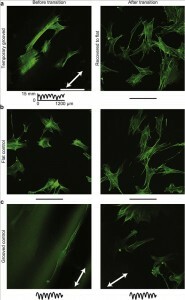 Davis and Henderson’s work collaboration with Kelly Burke of Case Western Reserve University and Patrick T. Mather, Milton and Ann Stevenson Professor of Biomedical and Chemical Engineering at Syracuse University–is highlighted in the January issue of the journal Biomaterials, the leading journal in biomaterials research. After confirming that cells remained viable on the substrate, Davis then investigated the changes in cell alignment on the surface that results from topography change. Davis programmed a SMP substrate that transitioned from a micron-scale grooved surface to a smooth surface. When the cells were seeded on the grooved sample at 30ºC the cells lined up along the grooves of the surface. The substrates were then placed in a 37ºC incubator, which was the transition temperature for the substrate to recover to a smooth surface. Following shape memory recovery, the cells were observed to be randomly oriented on the substrate. This research project aimed to determine if cells could remain viable with a change in substrate topography and determine whether cells responded to the change. The next phase of this research is to move from a 2D substrate to a 3D substrate and examine cell viability. Additionally, Henderson’s team will be looking at what is going on inside the cells as a result of topography changes. The application of shape memory principles offers potential solutions for current limitations of static substrate research in bioengineering research such as medical devices and tissue engineering scaffolds. 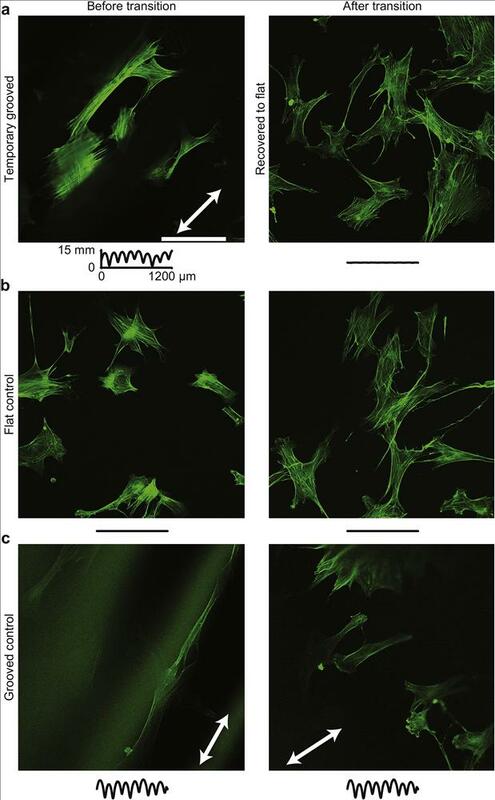 “For the first time, we’ve shown that this general concept can be used successfully with cells, which suggests that it can be extended to a number of biomaterials that could be used for scaffolds and many other applications,” says Davis. Since most scaffolding is made out of polymers, Henderson envisions one day using SMPs to create scaffolds that can expand inside the body allowing for less invasive surgical procedures. The LCS team of researchers led by Henderson included Davis; Mather, director of the Syracuse Biomaterials Institute and Milton and Ann Stevenson Professor of Biomedical and Chemical Engineering, and Burke, a former Ph.D student in the Mather Research Group. Read the InsideSU news article here.